JEFF SMITH started the evening session with a bang as he impressed in a 2-0 victory over talented youngster Luke Humphries in their preliminary round encounter. Arguably the tie of the preliminary round pitted former Lakeside Championship finalist Smith against rising star Humphries, who won the Development Tour Order of Merit following five wins this year. Canadian star Smith banged in a maximum 170 finish in the very first leg, and that set the trend for some smart finishing from both men, who only missed one dart at a double each in the match. Smith hit the bull again to take out 82 and completed a 3-2 win in the opening set with a 106 outshot as his experience seemed to be the difference. Humphries started well in the second set with a 94 finish but had no answer to Smith’s finishing as the former PDC Tour Card Holder took out 78, 126 and 74 to book a first round date with Gary Anderson. 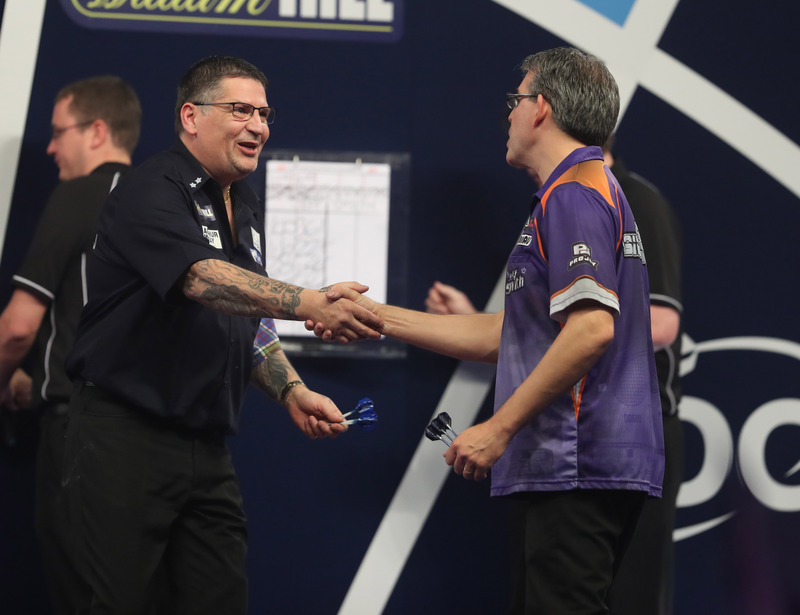 TWO-TIME winner Gary Anderson opened his William Hill World Darts Championship campaign with a convincing 3-0 victory over Canadian Jeff Smith. Canadian ace Smith had opened the evening session with a 170 checkout as he defeated youngster Luke Humphries in straight sets in the preliminary round, but was unable to upset the odds against the number three seed. Double champion Anderson produced some of his best scoring in his first round run-out, with seven 180s deflecting the attention from 18 missed doubles as he averaged almost 101. The second set was other-worldly from Anderson though, and he averaged just under 132 courtesy of four 180s and the first ten-dart leg of this year’s tournament in a run of ten, 11 and 12 darters. Former Lakeside Championship finalist Smith had missed just one double against Humphries, but hardly got a sniff early on as he was bullied out of the contest. “That’s a bit better than what I thought it would be,” said Anderson. “The 180s were flying in but I was making a mess of some counting – but I’ve done it before and we’ll get over it. Anderson has reached the final in each of the last three years at Alexandra Palace, winning two titles before seeing Michael van Gerwen claim the trophy 12 months ago. He added: “This is everything, you ask anyone and you’ll get the same answer. Michael took it off me last year and I’d love to do the same to him this year.